BOSTON, MA--(Marketwire - January 17, 2011) - Cheapflights.com, the online leader in finding and publishing travel deals, is on a quest to deliver the world for less to travelers. To help make travel planning easy and fun, Cheapflights.com has added a new way to find deals on trip types of all kinds and to all sorts of places. And, to boost convenience and fast access to travel deals, anytime and anywhere, Cheapflights now offers a mobile site that brings this new style of search as well as traditional deals search to smart phone users. With a click on the "Be inspired" tab on the homepage at Cheapflights.com, travelers can now look for a deal in the same way they would describe a trip they want to take. They simply name a departure point, time frame and, if they choose, a trip type such as beach or ski and snow or city break. With a click they see up to a dozen possible trips. From there, they can use sliders to enhance the search based on budget, location and even average temperature. "Travelers have asked for a simple tool that reflects how people think and talk about planning a trip," said Chris Cuddy, CEO of Cheapflights Media. "We have found that the most frequent questions travelers ask when exploring a trip are when, where, and how much. We've designed our new search tools to be a natural extension of these conversations. It's accessible from your mobile device and computer so that you're prepared, whenever or wherever a travel discussion breaks out, to find the best travel deals." The "Be inspired" option opens up a world of travel possibilities, allowing users to brainstorm about where they can go and what they can do. Users cast a wide net to start and then use simple filters to refine their search. This offering means users coming to Cheapflights.com have a choice of deals search, date search and, now, ideas search. With the launch of our new mobile site, m.cheapflights.com, users on the go can access Cheapflights.com's inventory of deals on flights departing in the next 90 days. The site, which is optimized for a wide variety of smart phones, works as an extension of Cheapflights.com. Deals Search -- The plane icon on the left takes users directly to the mobile optimized version of Cheapflights' popular deals search where they can plug in a departure and a destination and see a selection of flight deals from our airline and OTA partners. Inspiration Search -- The globe icon in the middle links to the inspiration search, which maps a range of deals and destinations available to help would-be travelers see all their trip possibilities in a glance. Users can simply select or use the phone's GPS location finder to auto locate a departure point. They then choose their preferred departure time frame and have the option to select price range and trip type, such as ski & snow, beach or family. Deal options show up on a map, and users have the power to edit the search and learn more about the chosen destination to find just the right trip. They can then share the deal they have found with other would-be travelers via email, Twitter and Facebook. My Suitcase -- The luggage icon on the right launches a packing and planning guide that helps users prep for the trips they book with helpful preparation lists and details about their chosen destination. Cheapflights Media is an international media network providing users with different ways to find low cost travel. Since 1996, Cheapflights Media has been helping consumers research, compare and save on domestic and international travel. Our flagship brand, Cheapflights, is one of the largest flight deals publishers, delivering over 4 million deals daily. With brand-name deals on airline tickets from more than 300 partners and 600 airlines and a team of travel experts hand picking the best offerings, Cheapflights offers visitors a mix of deals they can't find anywhere else. Zugu, the newest brand in the Cheapflights Media portfolio, is a powerful and simple travel search engine that makes it easy to compare and select the lowest available fares online. By organizing flight options by date, airline and time, zugu helps consumers find the best fares based on their travel terms. There are currently Cheapflights-branded sites for the U.K., U.S., Canada, Germany, Australia & New Zealand, France, Italy and Spain. zugu is available in the U.K., U.S. and Germany. For more information, visit www.cheapflights.com. Screenshot of Cheapflights.com's new mobile optimized website. The new site, which is optimized for a wide variety of smart phones, works as an extension of Cheapflights.com. For the first time, travelers can search for great deals and new destination ideas with the touch of a button. The streamlined mobile site offers three user paths, including Deals Search (plane icon), Inspiration Search (globe icon, as shown), and My suitcase (Luggage icon). Access travel deals, anytime and anywhere. 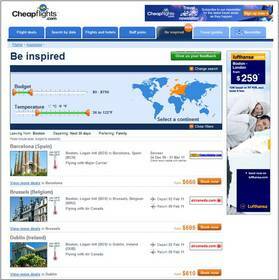 Screenshot of Cheapflights.com's new Inspiration Search tool. This new way of travel search opens up a world of possibilities, allowing users to brainstorm about where they can go and what they can do. Travelers cast a wide net to start and then use simple filters to refine their search. This offering means users coming to Cheapflights.com have a choice of deals search, date search and, now, ideas search.